Nutella swirl banana muffins are loaded with flavor! 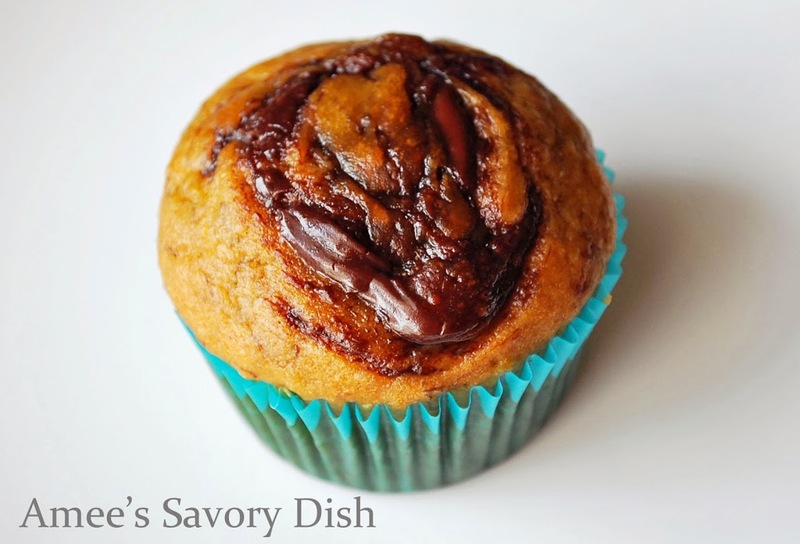 Moist banana muffins with a delicious swirl of chocolate-hazelnut spread throughout. This easy muffins recipe is kid-friendly and the best banana muffins I’ve ever tasted. Splurge Alert! These Nutella swirl banana muffins are a kid favorite in this house. I mean, who doesn’t love Nutella??!!! Makes 12 muffins. These babies are amazing warm!! Add melted butter and combine with an electric or stand mixer until smooth. Add coconut sugar and egg and blend. Whisk all dry ingredients in a separate bowl and add to banana mixture. Line a muffin pan with baking cups and fill about 3/4 way full with batter. Top each batter cup with a tablespoon of Nutella and gently swirl with a knife. If you love the Nutella swirl banana muffins, I think you’ll love these recipes, too! These looks so pretty and delicious! I love anything with Nutella and always have extra ripe bananas left on the counter — adding these to recipe box now! Thank you Sarah! We love all things Nutella in this house! My kids would eat cardboard if it had nutella on it. These looks so amazing, what a great treat!